Lilli questo outfit sarebbe perfetto per me per questo week end, sarò in modalità turista :* . My weekend outfits actually do look quite similar to this as I like to be comfy and cozy especially when it gets colder. I recently got the best pair of joggers that look like trousers that I can't stop wearing. Happy weekend Lilli! Mi piace questo stile rilassato, ma molto curato!!! Splendida questa proposta, il maglione è stupendo! I also have a big passion for fluffy knits and Cardigan. Your selection is just perfect for my cozy mood at grey winter weekends. I also love the soft shades of this Look. 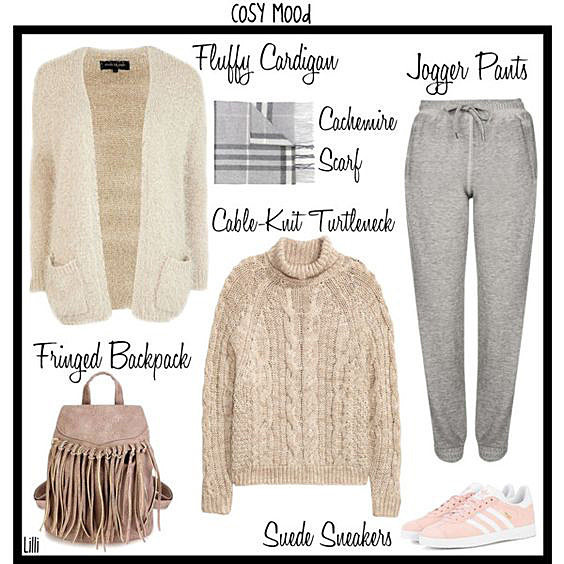 Nice tips Lilli, my fav pieces for weekend in winter are the cable knit sueter and the joggers pants because both are so cozy and comfy <3 Have a nice weekend hun! Luckily, it's been a warm fall here in Toronto. But it will cold soon and wearing a cozy sweater is just perfect. Love those suede Adidas too. I love fringed bags and jackets! I would totally wear these comfy clothes! I actually have similar items in my wardrobe ;) Have a nice weekend Lilli! Anche io adoro i maglioni e i cardigan pelosi, hai creato un look davvero perfetto per l'inverno!